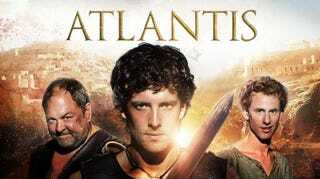 The second season of Atlantis kicked off with a two part story leading to a large battle. Jason and Ariadne still have zero chemistry as the central couple but that may not be a problem. Spoilers ahead. A year has passed since the end of the last season. King Minos is dead and Ariadne is heir to the throne. Pasiphae has raised an army and is on the march to Atlantis. Jason, Hercules and Pythagoras are Ariadne's special ops team tasked this time with recovering the Macguffin that ensures Atlantis won't fall. The main story is pretty much by-the-numbers. The climactic battle is won after the appearance of the reinforcements you knew would show up at just the right time. But there were still some things that stood out in these first two episodes. Ariadne is still dull as dishwater but she realizes she will have to be as ruthless as Pasiphae to rule Atlantis. She doesn't hesitate to have someone tortured for information or order Pasiphae killed if found. Best of all, she has to kick Jason to the curb because as Queen she needs to make a politically advantageous marriage to maintain power. Hercules confronts the Oracle and knows about Jason's mother now. How long before he ends up telling Jason despite his promise to the Oracle? I'm still waiting for the show to address Jason's origin. If you hadn't seen the first episode you might not even realize Jason is from our time. Jason clearly has forgotten where and when he's from. There are hints the Oracle knows and the revelation at the end of last season raises questions about Pasiphae's history. Hopefully we'll get some answers.